Parenting is tough work. I’m not talking about the emotional exhaustion. I’m talking physical, back-wrenching hard work. I don’t know about you, but after a day of looking after my kids, my back is in agony. I have shoulder muscle pain and I feel like an old woman. Think about it. How many times a day do you bend down to do something? About 50 gazillion? You pick a toy off the floor; you bend down. You help a child with a shoe; you bend down. You throw something in the trash; you bend down. You load and unload the dishwasher; you bend down. You put the cllothes in the washing machine; you bend down. Have a count yourself. Next time you’re with your kids. Count how many times you bend down in 15 minutes. You’ll be amazed. The worst? 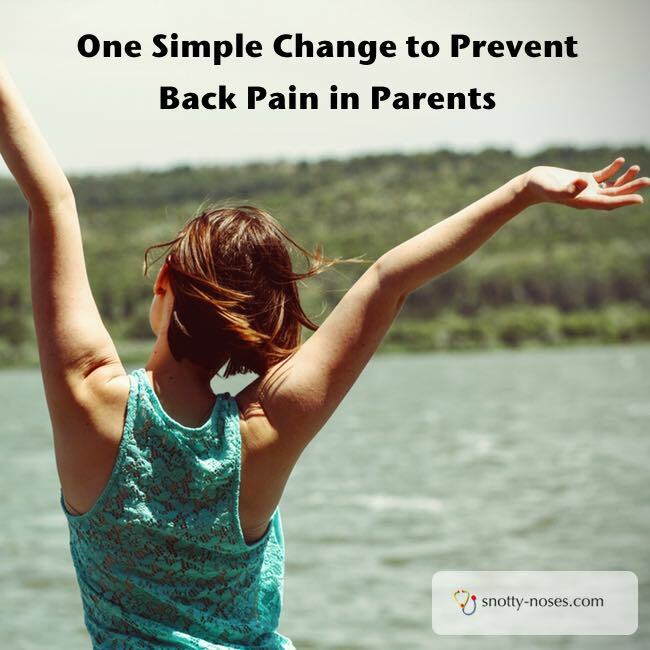 The stuff that really leads to wear and tear (and possibly longer or even permanent back damage) is twisting with a heavy object. For heavy object, think child. For example, putting your baby in their cot. You bend (BAD), pick them up and then twist whilst leaning over to put them in the cot. Your back isn’t designed to twist with a heavy object. It can seriously damage your back. AVOID TWISTING WHILST CARRYING A HEAVY OBJECT. Here’s the thing. Your back likes to be straight ESPECIALLY when it is carrying something heavy, like a child, or a ton of laundry or a mountain of toys. By bath time, I feel permanently bent over. I’m a withered old lady, twisted and stooped. I even put my hand on my back to straighten up. This is not great. I want to be an elegant, upright old lady when the time arrives. Preferably not now. The answer is actually a very simple one. You just need to get into the habit of doing it. At first it will feel a little strange, but when you get used to it, you’ll do it naturally. BEND YOUR LEGS INSTEAD OF YOUR BACK. You see? You knew all along didn’t you? You just needed to be reminded. Instead of bending your back all the time, keep it straight and bend your legs instead. Yes, a crouch. It’s good exercise for your legs too. If you want to do a little more, exercise that strengths your back and core muscles (the ones in the middle) will help too. Perhaps you could go to a yoga class or pilates? A great way to relax and meet new people. But if you’re only going to do one thing, make sure it’s to bend from your legs and not your back. By bath time, I’m no longer a the Hunch Back of Notre Dame. I’m tired, I’m exhausted but I’m an upright tree and my back doesn’t feel like someone has pounded it with a hammer. You pick a sock off the floor; you crouch down. You wash some little hands; you crouch down. You greet your child after school; you crouch down. You wipe a bottom; you bend down.